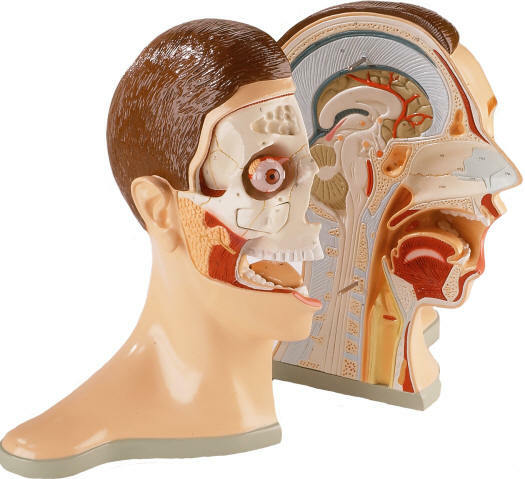 This life-size vinyl reproduction of the head and neck has been sectioned into halves near the median to display interior details of the brain, nose, mouth and throat as well as the exterior features of the head and skull. The skin and muscles of the right half have been removed to exposed the facial bones of the skull, sinuses, air cells of the ethmoid bone, parotid gland and the eyeball in its bony orbit. To facilitate further study, the eyeball, tongue and facial bone detach. 104 numbered features are identified in the corresponding key. This highly-detailed life-size 6-part head is mounted on a stand and features a removable 4-part brain half with arteries. The eyeball with optic nerve is also removable and one side exposes the nose, mouth cavity, pharynx, occiput and skull base. Comes with base. The left half of this life-size model in midsagittal section shows the muscles, with nerves, vessels and bony structures and contains a removable brain half. The head is mounted on a detachable neck part which is sectioned both horizontally and diagonally. Supplied on a mounting stand. 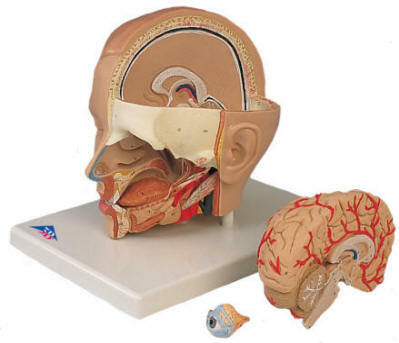 This life-size 3-part head is mounted on a stand and features a removable brain half with arteries, eyeball and optic nerve. The other side exposes the nose, mouth cavity, pharynx, occiput and skull base. All parts are numbered.